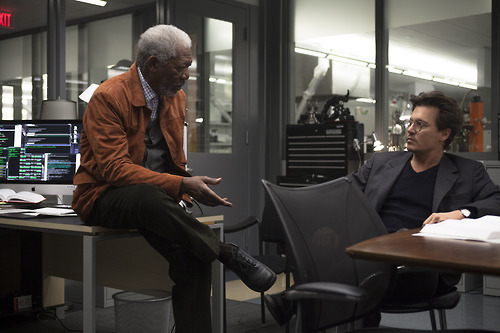 Morgan Freeman (left) and Johnny Depp star in "Transcendence." NEW YORK (CNS) — Despite its lofty title, the muddled sci-fi drama “Transcendence” (Warner Bros.) sinks rather than rises. Among the burdens weighing it down are a host of misguided notions — either embedded in the action or expressed in the dialogue — that might be menacing to the impressionable if they were any more coherent. Consider the premise on which the whole film rests: Fatally wounded in an assassination bid by a band of Luddite extremists called RIFT (Revolutionary Independence From Technology), Will Caster (Johnny Depp), the world’s leading expert on artificial intelligence, manages to upload his entire consciousness to a super-computer before dying. Will is aided in this project by his devoted wife and respected colleague, Evelyn (Rebecca Hall), as well as by his best friend, Max Waters (Paul Bettany), another esteemed tech guru. Max begins to have his doubts about the wisdom of what they’ve done soon after the transfer is complete. But Evelyn is a true believer, grateful that Will survives, if only through his voice and as an image on the screen. The next step is for cyber-Will to go online and acquire all the factual knowledge available throughout the Internet. His head thus swelled, however — physically deceased but intellectually flourishing — Will begins to veer between benevolence and megalomania. Since Will’s murder was part of a larger conspiracy that claimed several other victims, the FBI is on the case in the person of Agent Buchanan (Cillian Murphy). Buchanan teams with another of Will’s pals, outstanding researcher Joseph Tagger (Morgan Freeman), to hunt RIFT and its leader, disenchanted lab assistant Bree (Kate Mara). Once the threat to society’s future posed by Will’s outsized ambition becomes apparent, though, Buchanan and Tagger begin to wonder whom they should really be trying to stop. Philosophical confusion reigns in director Wally Pfister’s meandering movie, beginning with the implicit idea that all human mental functions are purely physical and ending with virtual reality somehow permeating the world of nature. And there’s a dollop of irreverently expressed disbelief in the divine to go along with all the other off-kilter concepts. Still, mature viewers are likely to be too bored by the slack proceedings to be much misled by the fast-and-loose — or downright nutty — concepts underlying them. The film contains complex themes, including atheism, some violence and gore, a brief nongraphic marital bedroom scene as well as a couple of uses of profanity and of crass language. The Catholic News Service classification is A-III — adults. The Motion Picture Association of America rating is PG-13 — parents strongly cautioned. Some material may be inappropriate for children under 13.